Kendo UI framework is developed by Telerik, which is a leading provider of development and testing tools for web, desktop and mobile applications. Kendo is an HTML5, jQuery-based framework for building modern web apps. The framework features more than 10 UI components, including a Grid and Chart, and all of the tools needed for a HTML5 app development, such as Data Binding, Templating, Drag-and-Drop API, and more. There’s no need to manually assemble a full framework for HTML app development; Kendo provides all the pieces, designed to seamlessly work together. It’s UI and much more. Kendo UI is dual-licensed, Commercial and Open Source (GPLv3). The Commercial license includes full source, professional support, access to the latest Kendo UI hotfix builds, and priority influence on the Kendo UI roadmap. Kendo UI is very easy to use, and it’s free for download as we mentioned. Why not give it a try and see if you like it or not? 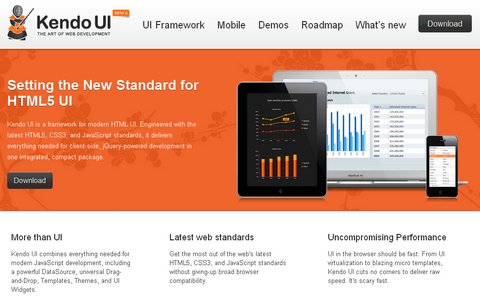 I am sure you will be impressed what Kendo UI can do for you. I see nowhere on their site where they give an explicit GPLv3 licensing. All I see is in their licensing agreement is that you may not redistribute the software. It’s a rough EULA. @Kenny- Kendo UI will be dual-licensed when it officially ships this November: GPLv3 and Commercial. The EULA you see today is just for the beta (standard legal stuff). The updated EULAs and licensing will go-live with Kendo UI RTW. Hope that helps. Have fun playing with the Kendo UI beta!